Put the Federal Open Market Committee (FOMC) minutes released today (Wednesday) in the back of your mind. The prospects for the 2015 stock market raise a lot of questions. The FOMC meeting minutes provide no answers. The 2015 stock market faces falling oil prices, a stronger U.S. dollar, and fears of a 2015 stock market correction. This is setting the stage for a volatile 2015. Money Morning Capital Wave Strategist Shah Gilani believes there could be a 15% to 20% stock market correction "in short order." "We have the central banks in the United States and across the world papering over the world's problems and I think we're going to have to see some more of that in 2015," Gilani said at the end of last year on FOX Business' "Varney & Co." "But underlying that, I think the valuations have gotten far ahead of themselves… my expectation is that we're going to have a very, very, exceptionally volatile year and I wouldn't put it past the markets globally to see some significant pullbacks." Put simply, 2015 is uncertain. And the U.S. Federal Reserve's reticence is not helping. But there are a number of directions the Fed could go. Ignore the FOMC minutes. Here are three potential forecasts for the Fed in 2015. You would think the end of the taper would mean the end of coy language from the Fed. That was hardly the case. As the Fed winded down QE3 last year, Fed Chairwoman Janet Yellen and Co. peddled the same tired line – over and over again. It was drilled into the markets that the Fed would taper bond purchases until the end of 2014. Rates would increase a "considerable time" after the end of the taper. "Considerable time" became a line about how the Fed would be "patient in beginning to normalize the stance of monetary policy." According to the Fed, being "patient" is "consistent with its previous statement that it likely will be appropriate to maintain the 0 to 1/4 percent target range for the federal funds rate for a considerable time" (emphasis added). 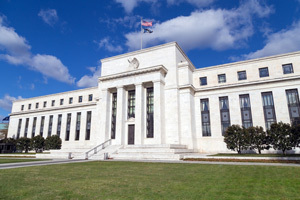 Despite what some financial news outlets reported, the Fed didn't drop "considerable time." They shifted it. Very little has changed in the Fed language and this is what we're likely to see a lot of in 2015 – a lot of talk and little action. Money Morning Chief Investment Strategist Keith Fitz-Gerald said the markets in 2014 hung on Fed rhetoric. This is likely to be a theme in 2015 as well. "I don't think the Fed is in a position where it can take its foot off the gas," Fitz-Gerald said last month on the radio program "Straight Talk Money." "They may not call it stimulus but you can bet they're going to do every bit of manipulation that they can to keep the markets moving, and whether that's accommodative statements, whether that's keeping certain language in their monthly meeting notes – I don't know what that looks like." How to Prepare: Tune out Fedspeak. Follow the same investment strategies you would otherwise. Fed rhetoric may be enough to stave off a quick intra-day drop but it won't be enough to instill long-term confidence in uncertain markets. Put your money in strong companies with good management addressing global unstoppable trends. For example, defense stocks. Try to ignore the policymakers and central bankers, and listen to those with real skin in the game. "I want to place my bets with the world's best CEOs, with the growing brands, with the growing cash flow, with the growing profit margins," Fitz-Gerald said. "That's going to give me the sense that politicians can't or won't."